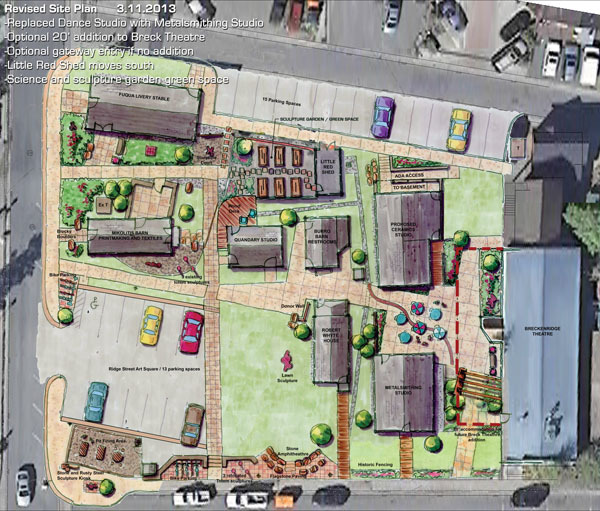 BRECKENRIDGE – Breckenridge locals and visitors will see a campus dedicated to the arts take shape in the heart of town over the next two years after the town council approved a significant renovation and upgrade to the existing arts district Tuesday. “We want it to develop into a really special place that would preserve open space and the art and the soul of Breckenridge,” town spokeswoman Kim Dykstra-DiLallo said. The arts district is a collection of historic buildings located between Ridge and Main streets that provides space for visiting artists, public workshops and classes. Town leaders plan to invest $2.3 million over the next two years reworking the area to create a cohesive campus that is inviting to pedestrians. The makeover will include the restoration of five existing historic structures, the construction of two new buildings and aesthetic improvements such as walkways, plazas, sculptures, green spaces and lighting, all intended to tie the campus together, according to documents provided by the town. Officials hope the arts district will eventually extend outward, connecting to the Blue River Plaza and the Riverwalk Center to the west and the old CMC building to the east. Those facilities are slated for large-scale improvement projects in the next few years as well. “The build-out of the Breckenridge Arts District will be a vibrant addition to the downtown core as part of the developing cultural spine from the Riverwalk Center to the Harris Street Community Center (old CMC),” a recent memo from town staffers to the council read. With the project approved, the town will likely start preliminary work on the arts district renovation this summer. When completed, the campus will feature a new 640-square-foot metalsmithing studio, designed to look like a residential structure, and a new ceramics studio. The metalsmithing space will be located between the Robert Whyte house and the Backstage Theatre, with the ceramics studio just behind it. > The Robert Whyte house, the home of an early Breckenridge hotel owner, now a museum, which will be returned to its original look with the removal of a nonhistoric addition and chimney. It will also be placed on a new foundation and its roof will be stabilized and redone to match the original. > The Burro Barn, a structure that collapsed several years ago, which will be restored to its historic look, relocated and modernized to house public restrooms. > The Mikolitis Barn, which will be rehabilitated, upgraded with new electrical, mechanical and plumbing systems and modified to house a printmaking and textile studio. Town officials plan to include the 121-year-old Abbey Hall, acquired earlier this month, in the district as well. The building’s prior owners used it as a church. It will likely become a dance studio when the current lease expires. The arts district, commissioned in a 2004 master plan to ensure the adaptive reuse of a number of historic buildings, was set to be fully restored and built out by 2025, but town leaders decided last year to accelerate the development. Officials now plan to finish the project by 2015.